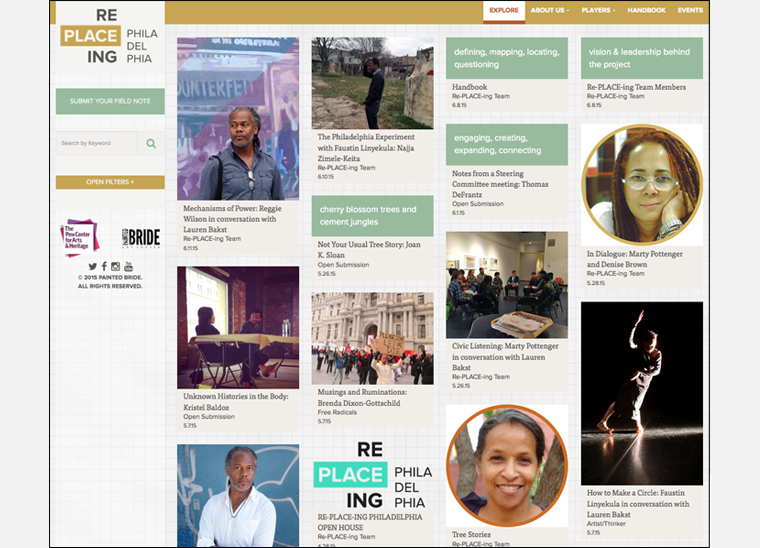 The Painted Bride Arts Center turned to the I-SITE team to partner on an innovative community arts and culture project that makes visible the “unspoken” and seemingly invisible archives of cultural memory in Philadelphia’s rich and diverse past. Funded by Pew Charitable Trusts Re-PLACE-ing Philadelphia called upon artists/thinkers Reggie Wilson, Faustin Linyekula, and Marty Pottenger to weave a critical dialogue and conversation within and around their work. For the online program Painted Bride challenged I-SITE to find innovative ways to report on the artists’ work and also encourage communities and the public to use their smartphones and tablets to share their stories and insights while on the move. All the site content, whether a bio, video or photograph, is in the form of a field note that is displayed on the home page and can be submitted by the public as well as the artists/thinkers, Free Radicals aka advisors King Britt, Marc Bamuthi Joseph and Brenda Dixon Gottschild, and the Painted Bride team. The field notes can be filtered by tags, author keyword and time period therefore creating a rich and interactive archive that will remain online as a resource after the completion of the 18-month project. The website built on Drupal 7, is fully responsive and uses Isotope and Masonry libraries to sort and filter interactively with the varying media formats and content published on the site. Post launch the I-SITE team continues to support the website with additional content and features.